According to statistics furnished by the Federal Bureau of Investigation, laser incidents in the U.S. average 9.5 per night for the period January 1 to August 7, 2014. This compares with 10.8 incidents per night in all of 2013, and is equal to 2012’s year-long average of 9.5 per night. 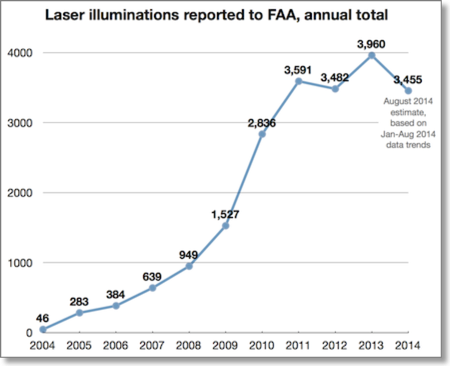 During the 219 days from January 1 to August 7, 2014, there were 2,085 laser incidents reported to the Federal Aviation Administration, according to the FBI data. This is a 12.8% reduction compared with 2,390 incidents during the same 219-day period in 2013, and is an 8% increase compared with 1,925 incidents Jan. 1- Aug. 7, 2012. One reason for the decline may be the FBI’s campaign to prosecute offenders, and to inform the public via press releases and public service announcements that it is illegal to aim a laser at aircraft. Based on the Jan-Aug 2014 data, the number of illuminations in 2014 is expected to fall below 3,500.